Written records generally denote the historic periods and date forwards starting from the year 1AD. Sometimes the past is simply dated backwards from the present date and refers to so many years BP (Before the present). The southern Celtic tribes cooperated with Caesar although inter-tribal warfare continued and in AD 43 this gave the Roman Emperor Claudius the excuse to carry out an invasion proper. This area was heavily involved at the time with Roman Germanic mercenaries pursuing the Celts from the Battle at the Medway across the Thames here while the main army with their war elephants had to cross further upstream and then fought back across this area to triumph at Britain’s capital at Camulodunum (Colchester).The Trinovantes were rewarded with local selfgovernment. A road was constructed (on the line of the A12) providing the strategic axis for the Romans to dominate the area; a Roman Staging Post was built at Durolitum (near Romford) and another possibly at Coldharbour near Rainham. Farmsteads or villas were built across the district for the valuable wheat production. But soon a Celtic Iceni uprising led by their Queen Boudicca swept south and united with the Trinovantes to raise Camulodunum to the ground. Their united armies swept across this area killing all Romano-British they could find, and then took the now abandoned trading post of Londinium (London), before sacking Verulamium (St. Albans). Soon after the Roman army finally met and defeated them, driving the remnant Celts back to their homelands and killing all Celts they could find on the way. Finally peace resumed and the Roman civilisation took over in Britain. After some four centuries of control the Roman Empire finally began to collapse and withdrew from Britain, leaving the Romano-British to defend themselves from the newly constructed forts along the Saxon Shore. Like the others the local fort at Othona (Bradwell-on-Sea) soon fell to the Saxon invaders and their devastating seax sword. There followed some 40 years or so of conflict , famine, disease and chaos and then the climate began to cool affecting farming, eventually one Vortigern, High Lord, emerged as leader of the federated states of the Britons and religion became a highly political matter. The land of the Trinovantes seems to have become the minor kingdom of Lundein with its capital at Caer Colun (previously Camulodunum – modern Colchester) which successfully resisted the invasion although a few places like Rainham, Wennington, Havering, and Barking have early Saxon names and may have been settled early on especially along the rivers. By AD 575-600 Lundein finally became the kingdom of the East Seaxe or ‘Essex’ and an East Saxon metropolis of market and ship building quickly grew up as Ludenwic, just outside the abandoned Roman Londinium. Over time these Saxon farmers brought order back to the land and the people, introducing administrative areas or Hundreds – allotting the west of this area to Becontree Hundred including the Royal manor of Havering and Barstable Hundred to the east with Chafford in the centre ground – with their meeting place to democratically iron-out disputes and so on at Chafford Heath, on the Rainham/ Upminster borders. The Bulphan fens or Saxon ‘fanns’ stretching from the Brentwood Heights down to the Thames marshes also extended from Rainham in the west to Canvey Island in the east and include Saxon place names like Dagenham, Cranham, Suttons Farm, Langtons, Stifford, Aveley, Purfleet, Thurrock, Warley, Ingrave, Horndon, Tillingham and Colchester. 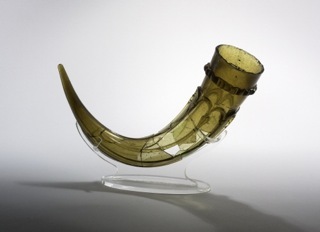 The people here aligned with their Jutish neighbours across the Thames and a magnificent pair of glass drinking horns – now in the British Museum - were excavated from a Pagan Jutish cemetery of national importance at Gerpins Pit, Rainham, more of the objects are held at Valence House Museum. For a period the High King of all East Anglia was Raedwald and it’s thought to be his burial at Sutton Hoo. The fabulous burial artefacts are now in the British Museum and some can be seen at the National Trust Sutton Hoo visitor centre near Woodbridge in Suffolk. The princely burial at Prittlewell is most likely to have been that of Saebert, the king of Essex from the same period and the impressive artefacts from that burial can be seen at Southend Museum. A later local king Sigeberht the Good invited St. Cedd to convert Essex and he founded a Celtic-style community at the monastery converted from the old Roman Saxon Shore fort of Othona, and built an Anglo-Celtic Cathedral at the fort gatehouse, which can still be visited. Travelling westwards Cedd also founded a monastery at Tilbury, passing through this area his name is commemorated in Chadwell St. Mary, Chafford Hundred, St. Cedd’s well, still beside North Ockendon churchyard on Walk no.1, and Chadwell Heath. Very soon after a Royal nunnery was founded by Saint Erkenwald c AD 666 and those Barking Abbey ruins are near Barking town centre and open to visitors. From c. AD 830 Danish Vikings began plundering England along the coast and rivers and the undefended Saxon settlements and farmsteads of Essex fell to the invaders, ‘the Great Heathen Army’, in the 9th century and they sacked Barking Abbey in AD 870. Alfred the Great, of ‘burning cakes’ fame, King of Wessex from 871-899, led the Saxon resistance. During his struggles Alfred hit back at the Danes on the Essex borders in AD 878 and achieved a negotiated peace restricting the invaders to eastern Britain north of the Thames – the area of the Danelaw and this area became part of the Kingdom of Guthrum. The Danes left little memory in this southern area by way of place names or other records, perhaps they felt no threat from their Jutish antecedents in Kent. Instead the Thames side seems to have mainly stood witness to the passing of aggressive Danish vessels along the river and the Essex coast. In AD 886 Alfred successfully reestablished English control of London, at that time called Lundenburh. To the east the battle at the Danish camp at Benfleet followed in AD 894 and the Danish force was driven from Essex between AD 911 and 916. However their coastal raids continued and in AD 991 the Battle of Maldon was fought by an Essex militia, but they lost to the Danes who were, for the first time, bought off by payment of a tax called Danegeld. Three years later the Norwegian King Olaf Tryggvason led a force of 94 ships along the Thames, only to be repulsed at London Bridge. Peace came with the conversion of King Olaf and the Danish King Harald Bluetooth from paganism, but Harald’s murderous successor son Sweyn I Forkbeard continued to wage war for 20 years. Finally in 1013 for his last 5 weeks of life Sweyn became England’s first Danish King. Sweyn’s son Canute the Great then gained control of the Danelaw, and succeeded to all England in 1016. According to legend it is King Canute who tried to turn back the tide and learned the lesson of the futility of such imperious action. Now the English landscape developed with farms, villages and towns together with a feudal social system with its hierarchy of reciprocal obligations. Essex however remained ethnically and culturally Saxon in character and no doubt finally welcomed the return of a Saxon King, Canute’s step-son the saintly Edward the Confessor. Following the death of King Edward in 1066, reportedly, although disputed, at his palace at Havering, the successor controversially chosen was Harold Godwinson Earl of Essex who became Harold II and last of the Saxon Kings of England. Only eight months later he marched north from London to successfully repulse an invasion by his rival Norwegian claimant, then immediately back south again passing through London to lose his throne to William and the Norman Conquest at Hastings only two weeks later. Today in the county of Essex the 1st. Battalion the Royal Anglian Regiment is nicknamed ‘The Vikings’ after the influence of the Nordic warriors on the eastern part of the Regimental area. In November 2012 hundreds of people lined the streets of Romford to welcome home ‘The Vikings’ after a six month tour of duty. More information on the Romans and the Dark Age can be found by visiting the Council for British Archaeology; The Ancient Monuments Society; English Heritage; and with finds like the roman coffin from the Dagenham/Mardyke border held at the British Museum and archaeological records held by Havering Local Studies Library. English Heritage manage a Roman Villa for visitors at Lullingstone in Kent; the Viking city of Jorvik has been rebuilt on its original site for visitors as the Jorvik Viking Centre in York; and an Anglo-Saxon village reconstructed on its original site at West Stow Country Park near Bury St. Edmunds is open for visitors to explore!